NOTE: Due to a bug in the Update function of DNGDeblur (fixed in version 1.1) you might be looking at the wrong page. If you arrived on this page through DNGDeblur and you want to download the latest version, please click here. ... into monochrome DNGs ! Adds deblurring option through Fast Fourier Transform and Wiener filtering. For an explanation how to use and apply deblurring, see here. 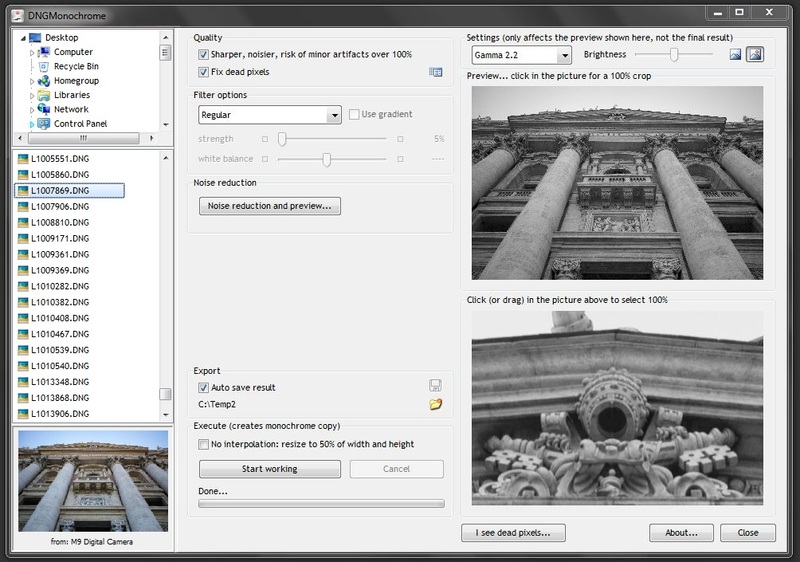 Adds a 'no interpolation' option for modified color cameras that have their Bayer filter removed. These cameras produce a monochrome luminance file but at the same time the file still holds parameters indicating it was shot with a color camera. This then leads to trouble in RAW converters, since the RAW converter is assuming it's a color photo. Using this new 'no interpolation' option will lead to an non-interpolated monochrome DNG and stop the RAW converter from interpolating. Do not use this option on color DNGs from regular color cameras. Fixes bug: after using the RGB filters in combination with gradient filtering (set to right to left or bottom to top), switching off the gradient and processing the photo again would lead to a regular photo and not an RGB filtered one. For more information on the DNGMonochrome Lightroom plugin (since version 0.9.72) for Windows 7 / Vista and Lightroom 4 and 5, see here. DNGMonochrome converts color DNGs into fullblown monochrome DNGs. The regular monochrome result DNGMonochrome produces, is based on the luminance portion of the sensor, under the assumption that interpolating based on luminance, without full color interpolation, leads to better results (resolution, sharpness, color noise) than a color interpolated result turned black & white. In addition, DNGMonochrome can also interpolate directly on the red or blue channel (the RAW filters) and use these results - mixed in with the regular luminance result - to create filter effects (the RGB filters). After the conversion the monochrome copy is recognised by RAW converters (see the list down for tested RAW converters) as a monochrome DNG, and no color interpolation is performed anymore. Note that the produced monochrome DNGs are not recognised correctly by all RAW converters. If the converter was not programmed to recognise the right parameters within the DNG - or it doesn't know how to process them thereafter -, loading them will fail. This is not a flaw of the DNGs, but of the RAW converter. If your favorite converter is not listed it doesn't mean the DNGs won't work in it. If you have a converter to add to this list - either working or not working - please let me know - including version number, and if it was 32-bit or 64-bit (if you are on Windows 64-bit) - see email under 'contact'. All converters listed here were tested on Windows 7 64-bit. Please note: This list is only valid for the monochrome DNGs produced by DNGMonochrome. I've tested the Leica MM DNGs also with some converters but not with all. DNGMonochrome itself is a 32-bit program. Note on Capture One: only the M8 and M9 converted DNGs work in Capture One. For some reason the Canon converted DNGs do not show up. Overall, Capture One doesn't seem the best choice for processing monochrome DNGs, since despite the fact the Leica converted DNGs work, the program doesn't seem to fully recognise the files are monochrome DNGs. Note that htis might have changed with the newest versions. If you're a novice, and do not know how a digital sensor works or what a Bayer filter is or what color interpolation means, start here. If you're well aware of what a digital sensor is capable of and what a Bayer filter does, and what color interpolation means, start here. Individual piece about my somewhat scientific approach, see this one. Individual piece on the additional red and blue filtering, see this one. The conclusion, with pro and con list (at the end) and all the examples on one page, see this one. Internet Explorer 9 (possibly other browsers too) might complain about an untrusted file during setup, since the setup file is not digitally signed. You can safely ignore those warnings (provided you trust me :-) ) and run the setup. DNGMonochrome uses quite a bit of memory when constructing the red and blue filtered image... memory usage can go up to 300 or 400mb. This is normal, since in the red or blue process, DNGMonochrome is juggling several copies of the original DNG and needs additional memory for the processing... If your virus scanner starts to complain, just ignore it. The memory is released after the photo is finished. Note that the preview gives just a quick indication. Inspect the DNGs in your RAW converter. Also, the RAW red and RAW blue result will look too dark. This is normal. You will have to lift exposure when processing the RAW red or RAW blue filtered DNGs, because the chroma values of red and blue lack any luminance correction. I have considered correcting that in the DNG itself, but then there's the risk of clipping or altering the character of the photo by trying to avoid clipping, so I decided to leave it like this. DNGMonochrome was tested on Windows 7, Vista and on Windows XP service pack 3. Beyond these specifications I can not guarantee proper functioning. The resulting DNGs were tested in the RAW converters mentioned earlier on this page. DNGMonochrome, ememsoftware and the lonely programmer behind it are not affiliated with Leica in any way. DNGMonochrome is freeware and does not contain ad- or spyware. By downloading this software, you (downloader) agree not to hold me (programmer) liable or responsible for failed photos after the use of DNGMonochrome. By downloading you agree that the use of DNGMonochrome is AT YOUR OWN RISK. If you DO NOT agree to above two points, then DO NOT download/install/use DNGMonochrome. In fact, if you do not agree, you don't have the programmer's permission to use DNGMonochrome and he will tell you 'I told you so!' if you come nagging at his virtual doorstep about a lost Pulitzer Prize or a bungled up World Press Photo due to DNGMonochrome. Improves the red and blue conversions. Especially the red conversion could suffer from a zipper like artifact, visible mostly on highlighted edges with bright red background. This started showing in some photos around 200 to 300% magnification. Improves the algorithm by applying a localised minimum and maximum during interpolation, which helps especially the very noisy photos and improves the outcome of the algorithm when used together with the 'sharper' setting. Adds a manual 'Update check' through a new button in the main screen... it will tell you if there's a new version available, provided you're online. Fixes the 'maze' artifact on M8 and M9 conversions. This problem showed mainly on M8 photos and in brighter red areas of M9 photos. On the M8, the artifact was visible at 200% magnification with sharpening set to at least 20%. Incorporating the BayerGreenSplit value in the algorithm solved the issue. On the new M and the Canon conversions, the artifact didn't show (the BayerGreenSplit value on the M is 50 - for the M8 and M9 it's 500 - and on the supported Canons the value isn't registered at all when converting CR2 files to DNG). Fixes the few artifacts left when using the 'sharper' setting. Due to the implementation of the BayerGreenSplit value, the 'sharper' setting has less effect now on M8 and M9 photos (compared to previous versions). These artifacts were only visible at 300 to 400% magnification, mostly on highlighted edges. Fixes several smaller bugs that could have had a negative impact on the RAW and RGB conversions. Adds option to skip the interpolation and go for a resize, only keeping parts of the green channel... this leads to 25% of the original photo (50% of the original width and 50% of the original height) keeping only the luminance pixels. It's mainly useful if you intend to downscale the original (smaller than 50% of the original size or width). You get the true luminance result without interpolation. You can still use all the filter options, since the red RAW and blue RAW are also resized, and perfectly overlap the regular result. For DNGs of the Leica M9, this option leads to a regular result that would be equivalent to the output of a 4.5mp black & white sensor. You can also use this option as a quick preview, since it's faster than interpolating. Then, after getting to the desired result (e.g. the right filter settings), turn the option off and make the final copy. Don't use this option if you intend to print the result. Note: despite the fact I call the new filters RGB, they are not RGB belonging to a color space (e,g, CIE RGB, sRGB, ProPhotoRGB or AdobeRGB)... They should be considered a mix of white balanced primaries, in essence still RAW. The white balance can be altered before filtering.